GGMania got a chance to talk with Andrey "KranK" Kouzmine of K-D Lab as he answers a few questions regarding to Perimeter, their upcoming upcoming 3D real-time strategy game for publisher 1C. We also have four exclusive screenshots from the game. Perimeter is slated for release later this year. GGMania: Could you introduce yourself to our readers and tell them a little bit about what you do on Perimeter? Andrey "KranK" Kouzmine: My name is Andrey "KranK" Kouzmine, game concept designer and producer. GGMania: Can you give us a little background on the development team working on Perimeter? Andrey "KranK" Kouzmine: K-D LAB was founded since 1995. In 1998 we released our first big game "Vangers: One for the road". The game was considered one of the most extraordinary and interesting games on the market in 1998 and received high appraisal for the quality and concept. In early 1997 we released a small logic game called "Biprolex+" as a freeware product, worldwide. The game held Internet Top Download 40 for seven months. We ourselves were addicted to it for a long time, so exciting it was. You still can find Biprolex+ on many gaming sites. In 1998 our MOBL project was awarded Grand Prix at the ENIX Game Software Contest II (the money prize of $200'000), a worldwide contest of most original computer games held in Japan. In 2001 we released arcade racing game Spanking Runners in Russia, CIS and some European countries. Our strategic partner is the largest Russian software distributor and publisher 1C Company. Currently we have more than 15 people in the team working on Perimeter. 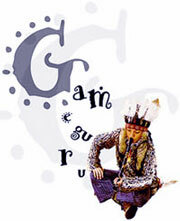 The company is located in Kaliningrad, the most western city of Russian Federation on the Baltic seaside. GGMania: What kind of game is Perimeter? What were the main objectives you wanted to achieve in regards to content and gameplay? Andrey "KranK" Kouzmine: Perimeter is a real time strategy in original sci-fi universe based on territory seizure with a lot of terraforming, so when we say "RTS" we actually mean Real Terraforming Strategy. The recent trend in game industry shows that many developers tend to make new games within some standard paths, and new gameplay ideas don't appear too often. Though, Perimeter does not copy other real-time strategy products but offers a balanced combination of new gameplay principles of territorial wars with traditional strategy elements. We want to establish some new branch in RTS genre. GGMania: Needless to say that it's quite hard to develop any good game for current market, what makes Perimeter unique among today's real-time strategy games? Will there be anything new that we've never seen before in any game? Then comes Territorial Warfare. That means that the gamer encircles terraformed and captured zones by impenetrable force cupolas that essentially change combat tactics to protecting perimeters from opposing parties. The next thing is a group of modifiable Combat Units. The units composed by the gamer are no longer integral during a mission. 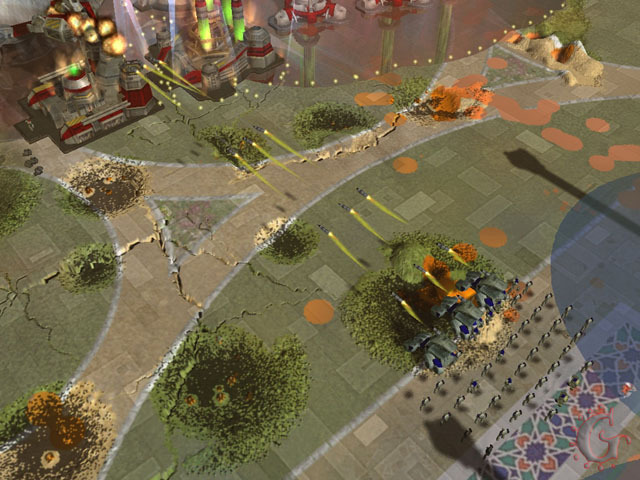 Owing to nanotechnologies they can be transformed right on the battlefield thus giving the player powerful tactical opportunities to adapt combat units to a particular situation. GGMania: What can you tell us about the storyline for the game? Andrey "KranK" Kouzmine: Perimeter takes place in a detailed science fiction universe and embraces an epic plot centered on the fate of Exodus civilization that once abandoned the dying Earth in search for a new world. In the nearest future mankind will find a way to other worlds, avoiding astrospace flights that are actually impossible for our biological species. The way outward will be found through the so called "subspace" or Psychosphere. Then a great Crisis broke out on Earth and a group of men uses an opportunity to leave Earth looking for a new world trough a chain of small interstitial worlds untenable for long stay and bound with each other by Portals. But during the hundred years of this epic odyssey a part of men lost the faith in happy ending of this expedition, the same as Columbus ships burst into rebellion willing to go back home. It is the human nature. But this time everything is much more complicated. Each hostile group has powerful technologies and strong ideological forces as a background. Some want to continue the search for the Promised Land, the others try to find the way back to Earth, but all of them are trapped in the Chain. Player witnesses and participates in this tragic confrontation for hundreds of years. The whole Exodus Civilization travels through the Worlds' Chain in the six huge mobile city-ships called Frames. The Exodus history is a history of Frames moving from one world to another and fighting with each other. You can read the full version Exodus prehistory at Perimeter official website. GGMania: What can you tell us about the combat units in the game? Andrey "KranK" Kouzmine: As I said, a player can transform a certain amount of basic units to get more complex units right on the battlefield. There are three types of basic units that could be produced by the plants: "soldiers", "officers' and "technicians". To have more complicated units a player has to research the "recipes" in special Laboratories, but cannot create the "recipe" by himself. The types of weapons vary from bomb, laser and rocket weapons to flying units and Special Forces such as underground torpedoes. In Perimeter a player should control a lot of things in full 3D with highly detailed landscapes (furthermore, permanently altering! ), and it becomes a real headache to manage individual small units. We are not going to turn our game into "hard work" where the player just sinks in the sea of micromanagement. That is why all troops are combined in squads. It gives more control and helps manage transformations. 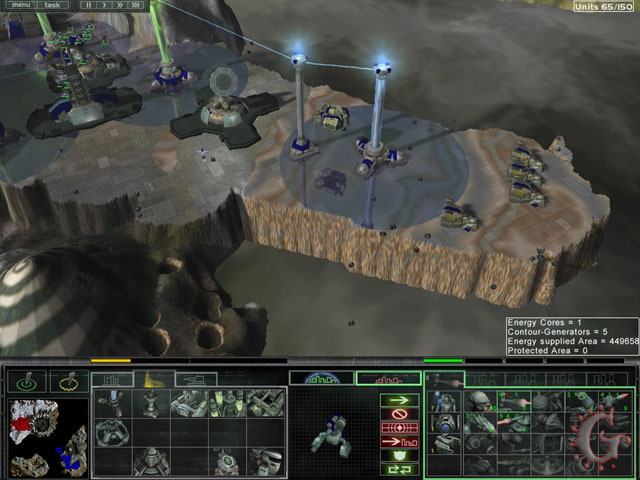 The player can hold several squads attached to different Command Centers. Each squad consists of only one type of complex units with support of the basic units. 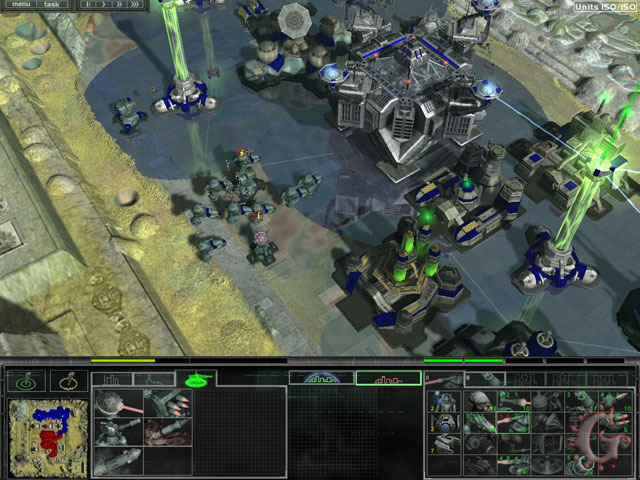 Moreover basic units still carry significant functions, for example a number of basic technicians in a squad directly affect an armor level of the complex units. GGMania: How is combat handled in Perimeter? Andrey "KranK" Kouzmine: Like in other RTS games, in Perimeter you can make war with your combat units, tanks etc. But unlike to other RTS games you can also make war with your bases. This is big difference. You can enlarge your base by terraforming so far and capture the enemy base by your Perimeter, of course if your base is much bigger. Actually a lot of things inside the game are based on terraforming: you can penetrate the defensive Cupola of your opponent with the help of underground torpedoes and cause heavy damage to his base, or dig a trench to stop some enemy units. GGMania: How will the enemy AI function? Can you give us an example? Andrey "KranK" Kouzmine: The main AI function is to loose perfectly, leaving a player happy and proud of himself :). I would say that we are doing everything we can do to reach this balance. But nowadays AI still cannot replace a human opponent in all aspects. AI is a kind of coach in a single mode, guided by a storyline. In skirmish battles we are trying to do our best in delivering a deserved contender. There are a lot of new complex aspects for AI here because of strong "geometric" sense of the game. GGMania: How many missions will there be, and how varied will they be? Can you give us an example? Andrey "KranK" Kouzmine: We are preparing about 25 various missions for the single player mode. In each mission the player gets one of the six Frames and should complete the assigned objectives. Most of the missions are connected with the Portals the Frames can travel through. The player may be assigned to build the Portal of a certain type, charge it for a Jump to another world, protect it, capture or destroy it. The enemy Frames and the Filth (brutal creatures of the world itself) counteract the player. Also a significant factor in accomplishing a mission is the landscape, which makes the player plan his terraforming activity very carefully. For example, it's impossible to build a solid base on a world with a compound structure of indestructible areas that can't be terraformed ("soft" cells and "hard" walls). The player must develop new small territories and bind them together with the help of energy transmitters. The variety of maps adds a lot of opportunities to make more variable missions. Some missions will take place on the same worlds but in different periods of time. All changes made to the worlds are saved and after a special processing that emulates corrosion and erosion these worlds will be used as the basis for the next mission. 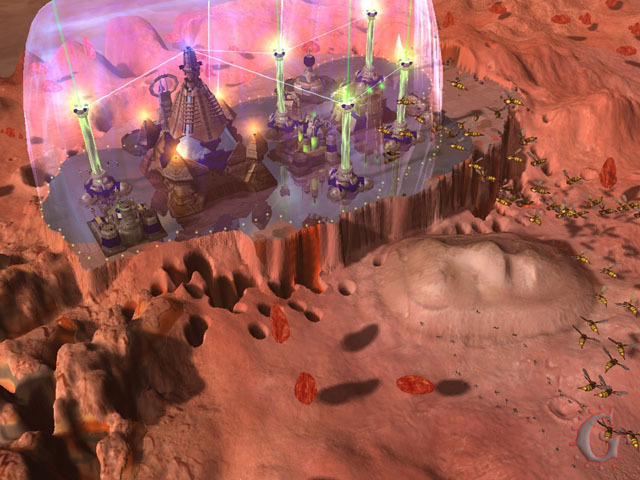 Isn't it exciting to get back to the world you developed some missions ago and take your own base under control?! GGMania: What sort of interface have you guys prepared for the game? Andrey "KranK" Kouzmine: Interface is simple and user-friendly, based on the familiar RTS principles. All functions are easy accessible. You will see it. GGMania: Which engine is used in Perimeter? Andrey "KranK" Kouzmine: We have our own engine that is capable of real time detailed transformation and rendering the landscape. Procedural textures, volumetric special effects with powerful particle system, sliding realistic movements of all game objects, in short - we use everything that helps to satisfy the demands of exacting RTS admirers. The game features realistic shadows with soft edges using pixel shaders 2.0 of Microsoft DirectX 9. We have quite a modern and competitive engine with an unique feel & look. GGMania: I've heard the engine can handle up to 1.000.000 polygons per frame, is it true? Andrey "KranK" Kouzmine: That is true, but actually we've optimized it to smaller amount. Really this is not so important for good game to count polygons :). GGMania: Now some Tech-stuff. What the current system requirements are for Perimeter? Andrey "KranK" Kouzmine: Minimal requirements are 128 MB RAM and GeForce2. To enjoy the highest details, all those nice reflections, realistic shadows, fantastic self-shading of all game objects, bump-map textures etc we recommend you to be armed with at least 256 MB RAM and ATI Radeon 9700+. GGMania: What type of music will be played during the missions? Andrey "KranK" Kouzmine: The music is a significant part of the game, it's not just some background stuff to switch off. The themes contain a lot of ambient, psychedelics, symphonic elements; there are a lot of drums and percussions as well as original electronic sounds. Suddenness in RTS like Perimeter is not so important as in action games, however we have some type of interactive music too. You can download some Perimeter music themes from here. GGMania: Will the game include multiplayer over a LAN and/or Internet? Andrey "KranK" Kouzmine: Yes, of course multiplayer will be important part of the game. Perimeter could be played via LAN and Internet using match-service. GGMania: What are some of your favorite aspects of Perimeter? Andrey "KranK" Kouzmine: I like the whole picture that I see in the game: highly detailed environment, interaction of all objects, every single tiny change of the landscape does not disappear but is accumulated with other changes. It is a large-scale process. Every single explosion and every single particle leaves a trace. In Perimeter we have got the picture that is not "sterile" like in other games that are not capable to gather all the changes. Our game is much more real, despite the sci-fi universe where it takes place. GGMania: Currently what is the status of the current progress of the game and when can we expect to see it in stores? Andrey "KranK" Kouzmine: We are planning to release the game by the end of 2003. GGMania: Will a demo be made available before the official release of the game? Andrey "KranK" Kouzmine: Yes, possibly. But it depends on the publisher's decision. GGMania: Thank you very much for taking the time to answer these questions. Andrey "KranK" Kouzmine: Thank you for the interview and good luck! i think the graphics look really really really cool. it needs the XVID codec to run the trailer. KD-Lab is cool !!! (Vi rulite rebyata)!! Oh where is my paloch'ka ?